With the Faroese transport infrastructure under pressure from rising export volumes, Faroe Agency’s position of market leadership in the ports and shipping sector is consolidated through more fisheries and insurance related business. These are times of capacity expansion in the Faroese ports, shipping and logistics industry. Driven by the current surge in pelagic fisheries, combined with public policy efforts to maximize utilization of marine resources, port authorities and businesses in key locations are scrambling to add dock space, enlarge container areas, extend cold storage facilities, and create new offerings. And with record levels of export sales in the aquaculture department, the situation is fueling optimism across most sectors. Since its founding, in 2004, Faroe Agency has been busy serving foreign vessels calling at Faroese ports. From the outset, Russian trawlers and freighters represented most of the clientele, and still do. Faroe Agency has two native Russian employees, agents Alexander Kuzkin and Sergey Lutov, both of whom are trilingual with fluency in Russian, English and Faroese. Meanwhile, one of the founders of the company, Árni Dam, who remains a member of the board of management after having retired as managing director, is the Honorary Consul of Russia to the Faroe Islands. Important as it is, this Russian connection, however, is not all there is to Faroe Agency. The company works with a growing number of vessels from a number of countries, including Dutch, Danish, Greenlandic, German, Norwegian, British and Irish. 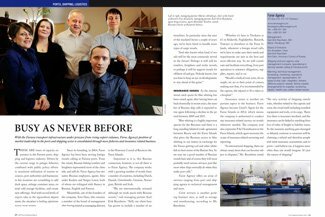 “We are internationally oriented although we work much with Russian vessels,” said managing partner Karl-Erik Reynheim. 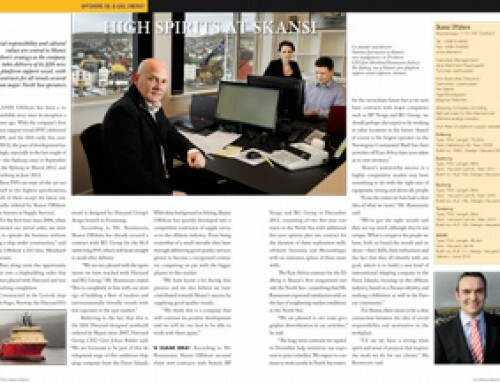 “Still, our client base has grown to include a number of nationalities. In particular since the start of the mackerel boom a couple of years ago, we’ve been hired to handle more types of cargo vessels. Insurance issues: As the international catch quota for blue whiting has been raised again after having been cut back drastically in recent years, the number of Russian ship calls is expected to rise again following a decline in the period between 2009 and 2011. Faroe Agency offers an array of services ranging from port and shipping agency to technical management and more. Crew services is another growing business area, as well as storage and warehousing, according to Mr. Reynheim. “Whether it’s here in Tórshavn or it’s in Klaksvík, Fuglafjørður, Runavík, Tvøroyri or elsewhere in the Faroe Islands, whenever a foreign vessel calls, we’re here to make sure their needs and requirements are met in the best and most efficient way. So we will coordinate and facilitate everything, from port operations to statutory obligations, supplies, repairs, and so on. Insurance issues is another important aspect to the business. Faroe Agency became Lloyd’s Agent for the Faroe Islands in 2012, which means the company is authorized to conduct any insurance related surveys on vessels whenever needed. The company now also represents P & I Scandinavia in the Faroe Islands, which again increases the scope of insurance related surveying and reporting.